Residential Ballard is generally described as extending from the 8th Avenue NW to the east and the bluff to the west, and from NW 85th Street on the north to NW 65th Street to the south. The area primarily contains single family houses, but also includes a collection of mutli-family dwellings, commercial buildings, schools, churches, and other buildings. Most of the historic buildings in Ballard are modest cottages and builder's houses, and were not architect-designed. Building styles include, but are not limited to, Victorian (primarily Queen Anne), vernacular, Craftsman, American Foursquare, Colonial Revival (including variations), Tudor Revival, Minimal Traditional, and Ranch. 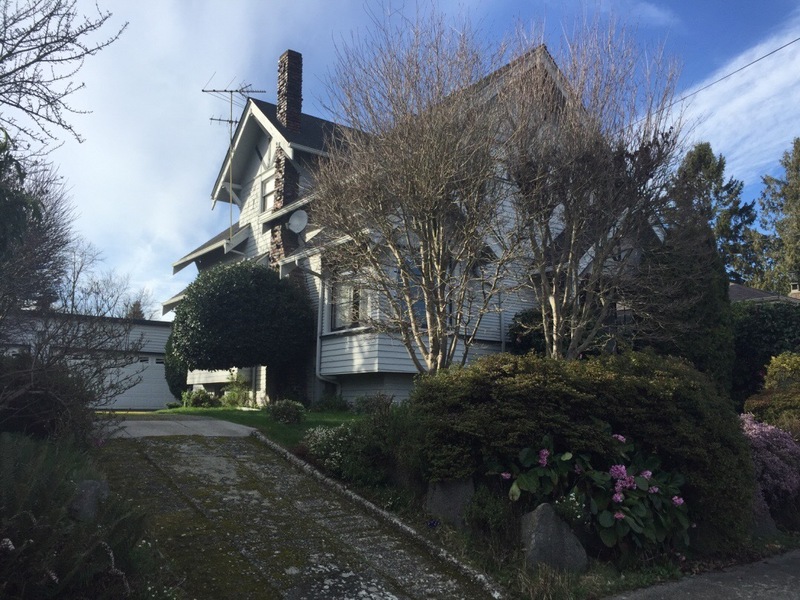 The historic building fabric of Ballard is threatened by a rapid pace of development. The City of Ballard was incorporated in 1890. It was the first community to incorporate after Washington achieved statehood in 1889. Although population increased rapidly, north Ballard was still relatively rural. In 1907, primarily due to lack of adequate water for its population of 15,000, Ballard citizens voted to be annexed to Seattle to ensure a good water supply for the area. After annexation Ballard’s street names were changed to conform to Seattle’s: Ship Street turned into 65th Street, Main Street became 15th Avenue. 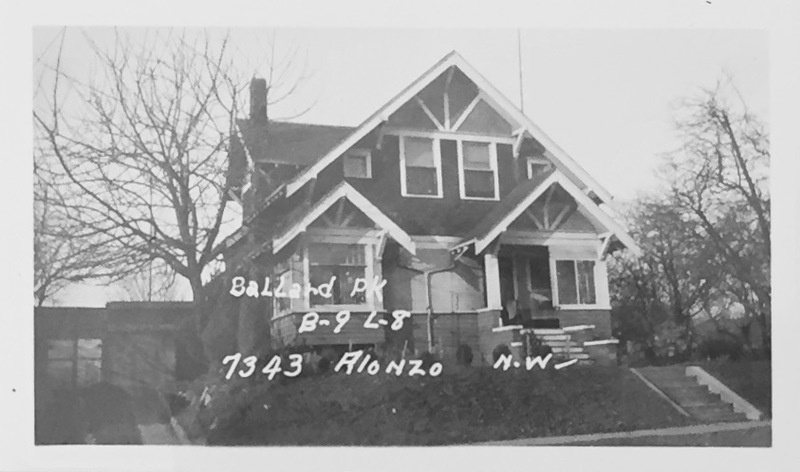 During the Great Depression and World War II, construction in Ballard nearly ground to a halt, with the exception of some houses built by Earl F. Mench. However, following World War II, fueled by the G.I. bill and the rise of the automobile, Ballard boomed again, and new housing followed. In recent years, the demand for new housing has spurred a tremendous amount of change in Ballard, with old, modest houses being replaced by large box houses and multi-family units. These changes threaten to alter the character and feeling of this historic neighborhood. Ballard Historical Society Classic Home Tour guides. Crowley, Walt. Seattle Neighborhoods: Ballard--Thumbnail History. HistoryLink File # 983, accessed 6/1/16. A Field Guide to American Houses (2nd ed.). New York, NY: Alfred A Knopf Press, 2013. Passport to Ballard: The Centennial Story. Seattle, WA: Ballard News Tribune, 1988.
sold to the nearby Free Methodist Church on Mary Avenue NW to be their parsonage. Per King County property records the sale to the church on 6.21.56 was for $12,500. It was occupied for the Reverend Forest Bush and his wife Ida. On 10.29.62 it was purchased by Lawrence R. Hilden and the following December they entered the “Christmas Trail” contest for judging as one of 300 homes in the Seattle Times’ city-wide Christmas lighting contest. Current owners are Virginia and Forester Lawrence. 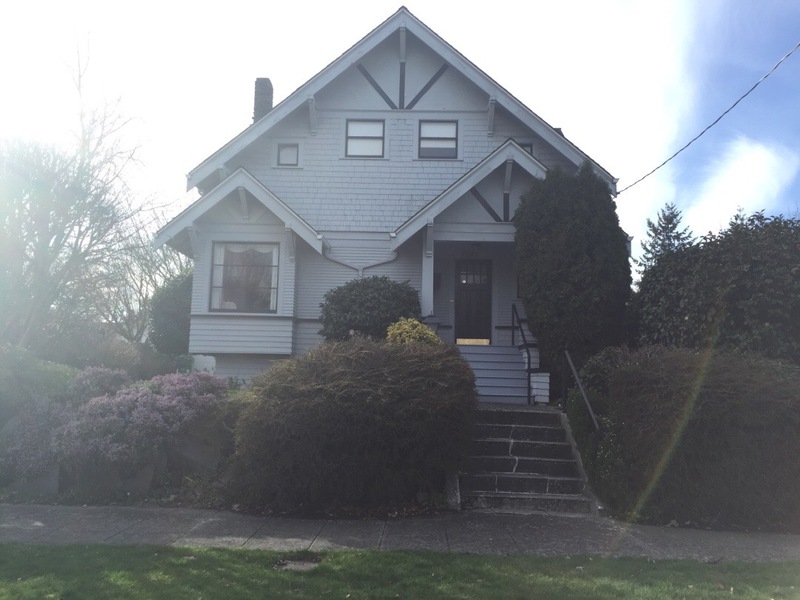 This 1-1/2 story house with a rectangular plan exhibits both Tudor and Craftsman influences. The steep cross-gabled roof has overhanging eaves with triangular knee braces below. Cladding consists of horizontal wood clapboard on the lower level, followed by coursed wood shingles on the upper story and stucco with decorative half-timbering on the roof gables. A wide course belt separates the wall materials. A projecting gabled entry porch houses a wood door and a multi-pane window to its right. South of the porch, a protruding front gabled square bay with a wide 9-paneled window takes up the first floor corner. A pair of centered 1-over- 1 sash windows, flanked by smaller squared windows complete the front elevation. The side (south) elevation has one sash window on the side gable, a tall exterior brick chimney and a shed projecting bay with windows on the western part of the first floor. House sits above the street on a mid-street lot facing east surrounded by a lawn and vegetation. Concrete stairs lead to the elevated porch and a paved uphill driveway on the south leads to a detached garage at the rear.